843 Shettleston Road, Shettleston, Glasgow. G32 7NR. Tel: 01417783601. The pubs on Shettleston Road haven't changed much in the last 100 years. In 1883 Thomas Japp ran this old pub, Known locally as "Japps", Thomas was born in Tollcross in 1844, he married a Shettleston lass called Bethia Dunsmore who was 5 years his senior. In the 1880s they lived in Main Street, Shettleston with their daughter Jane, Bethia's sister Elizabeth helped around the house and looked after young Jane while Mr & Mrs Japp worked in the pub. In 1898 Patrick McMullen took over the pub paying an annul rent of £75.00, McMullen served the locals here for many years. 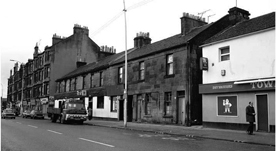 Shettleston Road with part of the Town Tavern showing and Deans Bar further along. 1960s. 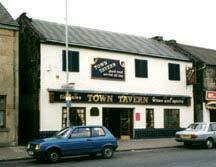 Town Tavern, Shettleston Road. 2005.